For the first time since figures were recorded, grey has been named as the UK’s most popular car colour for 2018. The records, compiled by the Society of Motor Manufacturers and Traders (SMMT), show that almost 21% of new cars sold in 2018 were grey, despite a 1.1% drop in registrations for the colour compared to 2017. Most of the top 10 car colours saw a loss in registrations last year, except for orange which went up 37% and surprisingly beige, staging a comeback with a 28% increase and knocking cream out of the top 10 after just 559 drivers opted to buy a cream-coloured vehicle. Black, which was the UK’s most popular car colour in 2017, suffered a 7.3% drop in registrations compared to its title-winning year, knocking it into second place in the 2018 rankings. White cars, which were enjoying a 4-year run of being the nations favourite until 2017, have now slipped to third, despite proving to be the most popular car colour in Scotland. Northern Ireland only registered 53 colours last year, while English motorists took advantage of the variety and registered an impressive 116 colours out of the 118 available to them. 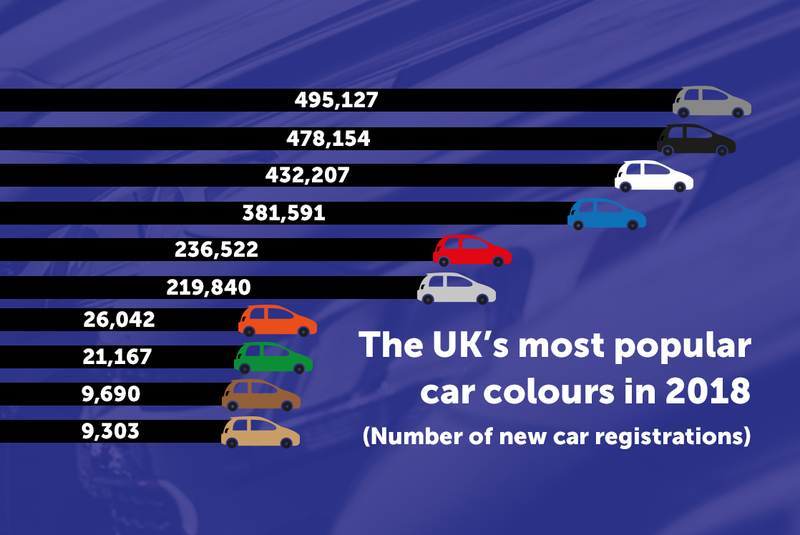 Despite the vast colour palette, the dominance of grey, black and white cars means that together they accounted for almost 60% of the UK’s new car registrations last year.